We must equip ourselves with the English vocabulary of a teacher to understand the most common instructions of a teacher or a trainer of any course or class or training that we attend. When you are attending a training session in your office the trainer will use English language and some English phrases are quite frequently used by all trainers. When you are preparing for examinations like IELTS the speaking test examiner may ask you about your favorite teacher. When you are appearing for any interview you may be asked about your college days or your favorite teacher from school or college. Meaning: To go over or go through something means to look at or discuss something in detail. Usage: Lets go over the first chapter now. Usage: You can leave out the last assignment given as part of the holiday homework. Meaning: remove marks made by pencil, chalk etc using an eraser. Usage: Please note things quickly from the board as I am about to rub it all out. Usage: Everyone will take turns at speaking your opinion about the class party. If you hand something in, you give it to someone with authority like a teacher or a police officer. If you hand something out, you give something to each member of a group e.g. hand out the books. If you hand something around, you pass something on to different members of the group especially things like food or drinks. Please hand in your homework assignments by Friday. Please hand out a copy of this quiz to all you classmates. Could you please hand around the snacks to everyone in the group. Usage: If you are attending this course then you should take it seriously otherwise it is better not to attend it at all. Usage: If you are not sure of the meaning of any word in this passage you can look it up on the internet. Meaning: it will have no positive results doing that thing. Usage: It’s no use studying at the last minute if you have never paid attention to the subject earlier. Meaning: only a small part of a much larger issue or problem. Usage: Not being able to pass the mid term is only the tip of the iceberg for him. He has many more issue to battle with. Usage: If you want to understand this chapter well then you have to go back to the third chapter and recall our discussion about it. 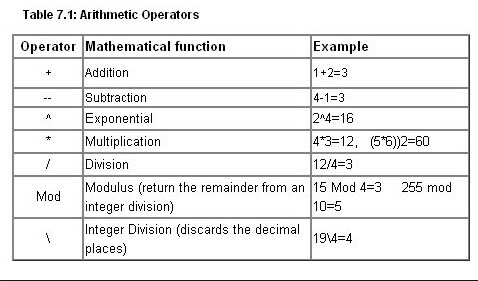 Imagine you are a teacher and you have to teach this lesson describing basic arithmetic operators to a group of arts and humanities stream students. How will you go about doing it? Try to speak 5 to 10 lines using the vocabulary words and phrases provided above.